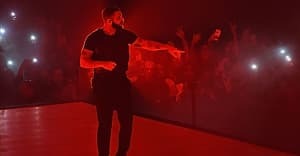 A clip of Drake talking about the Pusha T-signed microphone he references in "Duppy Freestyle" has resurfaced. Spin caught the floating video, which comes from MTV's short-lived series When I Was 17, on Twitter. Shared by Charles Holms, the clips finds Drake explaining how he bought the microphone online for $200, which his friends believed was a rip-off, especially since the plastic tool did not appeared to be verified. As a self-identifying “really, really big Clipse fan," young Aubrey found the signed mic after googling "clipse autographed." Drake is 31 now, and a lot of things have changed. Thumbnail image courtesy of Christopher Polk/Getty Images for Coachella.